4. 7. 2011: The photos are up. 29. 6. 2011: The slides are up. 17. 5. 2011: The Program. 2. 5. 2011: The list of Accepted Papers. 8. 4. 2011: The registration is now open. 6. 3. 2011: The submission deadline has passed and the submission server is closed. 7. 2. 2011: Submission server now open. Read more in the submissions section. WG 2011 aims at uniting theory and practice by demonstrating how Graph-Theoretic concepts can be applied to various areas in Computer Science, or by extracting new problems from applications. The goal is to present recent research results and to identify and explore directions of future research. The conference is well-balanced with respect to established researchers and young scientists. The proceedings will be published in the LNCS series of Springer-Verlag. We need the final version of accepted papers approximately two months after the conference. Support of these concepts by suitable implementations and applications. At least one author of every accepted submission is supposed to register and present the paper at the conference. The conference will take place in the premises of a Premonstrate Monastery in Teplá in West Bohemia, June 21. – 24. 2011. 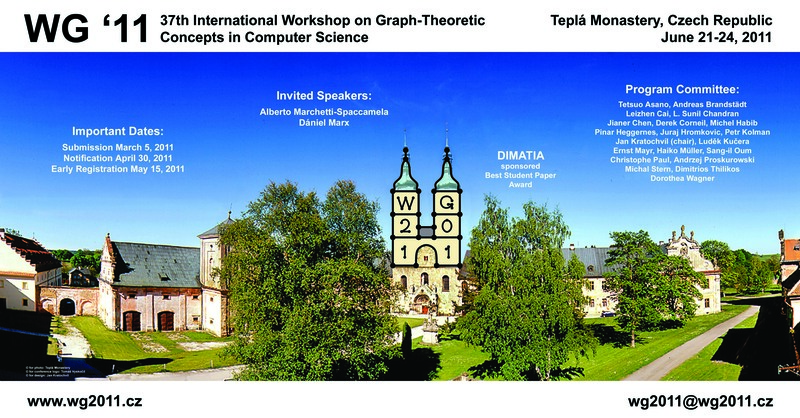 The conference is organised by the Department of Applied Mathematics and the Institute for Theoretical Computer Science of the Faculty of Mathematics and Physics at the Charles University, and Conforg s.r.o. A prize will be awarded to the author(s) of the best student-authored paper (or split between more than one paper if there is a tie). A paper is eligible if all of its authors are full-time students at the time of submission. A concise printable summary containing all necessary information is available in a Call For Papers PDF document. XHTML 1.0 Strict. WG2011 is proudly displaying the Bosa theme originally designed by If..Else. Powered by Textpattern 4.2.0.